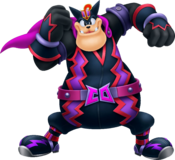 This is a list of Pete's forms and costumes in the Kingdom Hearts series. He wears what seems to be armor colored in shades of blue and purple overtop a red, short-sleeved shirt with a vertical pink stripe descending from the neck. He wears navy blue and white sneakers with light blue fronts and two periwinkle straps keeping each one secure. His pants are also navy blue, with light blue lining, purple lower legs, and two enormous pouches on either front side. These pouches are attached to his pants by four pins, both sporting a silver, horizontal zipper. The most distinguishing feature of these pants is the comically large zipper going down the front and reaching around to the back side of the pants. He wears two navy blue pauldrons, each sporting two cyan bumps and a periwinkle area near on the lower section on each shoulder. 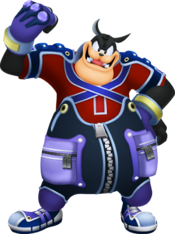 Two gold buttons at the top of Pete's pants connect to two blue suspenders that intersect over his chest before connecting to two similar, albeit smaller buttons on his shoulder pauldrons. Pete also wears a pair of fingerless gauntlets. The wrists of these gauntlets are light blue with a pale yellow semi-circle on top, while the gloves are periwinkle with a bump on each knuckle. There is a dark blue-green design on the back of each glove, descending from each knuckle to the end of the glove. Upon revisiting Timeless River from the present day, Pete's appearance, along with his outfit, takes on a monochromatic version of his modern appearance. 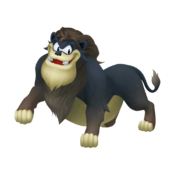 Also known as Lion Pete, Pete's Pride Lands form is an adult lion with predominantly blue-grey fur. His mane, the tuft of hair at the tip of his tail, and the lower halves of his legs are all grey. His toes, belly, and the fur around his mouth are all tan. The top of Pete's mane is pushed back, except for a few bangs that fall over his forehead. His pupils seem to be more slit-like that their normal oval-shape. Pete retains his four flat, square teeth in this form, and he appears more heavy-set than other lions. In his lion form, Pete is somewhat clumsy, shown when he slips while trying to get down from Pride Rock. Pete's using the Heartless to get control over all the worlds. He's helping Scar's phantom, too. Seems like Pete's trying to cover all his bases. 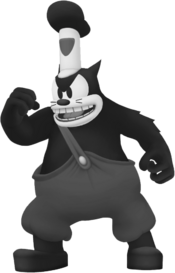 Also known as Captain Pete, Pete's Timeless River incarnation resembles the modern Pete, but has a stylized, monochromatic version of his early Disney cartoon appearance. He has black fur, very large eyes with pupils set close together. His mouth is white and he has four short whiskers, two on either side of his oval-shaped, black nose. His teeth are very straight and white. While still fairly heavy, Pete is noticeably thinner. He dresses in grey overalls held up with a single strap over his right shoulder, showing a tail from behind. The strap is secured by a white button and his feet are covered by black fishing boots. His captain's hat is a tall, cylindrical, white hat with a grey symbol shaped like a rounded triangle on its front and a puffy, black additive on its top. The hat's overall appearance resembles one of his steamboat's smokestacks, with the black additive resembling smoke. Upon revisiting Timeless River from the present day, Pete's appearance simply takes on a monochromatic version of his modern appearance. King Mickey's old nemesis. He traveled back in time on Maleficent's orders. As part of Maleficent's scheme to take over Disney Castle, Pete plans to destroy the Cornerstone of Light. Without the Cornerstone, Disney Castle will be defenseless. Captain of a river steamboat; this is a different Pete than the one we know. He doesn't seem to have any connection with the Heartless. Why, he doesn't even recognize Sora, Donald, and Goofy! I wonder if he's just trying to trick us. Captain of a river steamboat. He's Pete, but from the past. A long time ago, King Mickey started out working for Pete on his boat. Somehow, Pete's managed to get his boat stolen by himself — that is, by the Pete from the future! 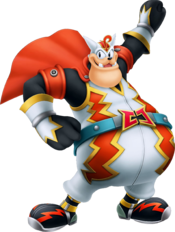 As Captain Justice, Pete dons a white jumpsuit with gold highlights and two large, orange lightning bolt patterns on its front. He has a black undershirt, orange straps on his upper arms, and an orange cape pinned to the shoulders of his jumpsuit. His gloves are white, gold, and black with a silver band around each of his wrists. His boots are black with silver soles, gold straps on the legs, and orange lightning bolts decorating them. The upper half of Pete's face is covered by a white mask with a red arrowhead bent into a shape resembling the letter "P". He also wears a teal belt with silver pins lining it and a red and yellow buckle. The buckle is a stylized version of the letters "C" and "J". Pete—Disney Town's biggest trouble maker—in disguise. The truth-and-justice shtick is just a ploy to garner votes and win him the Million Dreams Award prize. Sadly, this particular "hero" is better known for his deeds of derring-don't. As Captain Dark, Pete dons a black jumpsuit with red highlights and purple lightning bolts decorating it. The straps on his arms are lavender-colored, his cape is violet, and his gloves are red and black. His mask is black, but retains the red and yellow "P" symbol. Pete's boots are also black with red straps and purple lightning bolts on them. His belt is red-violet with a violet and silver buckle, resembling a stylized version of the letters "C" and "D". A "secret" identity assumed by Pete, Disney Town's biggest troublemaker. He is pretending to be a shadowy hero to garner votes and win the Million Dreams Award prize. Unfortunately, he's more shady than shadowy, and there's nothing heroic about him. 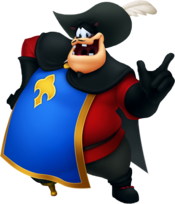 Also known as Musketeer Pete, Captain Pete, or Peg Leg Pete, Pete's Country of the Musketeers form is the leader of the Musketeers, and wears a large red shirt with charcoal grey pants, a thin brown belt, and black gloves, with one black boot with red laces on his left foot and a gold pegleg on his right. He wears a blue tunic with a wide gold border, and a gold fleur-de-lis on the chest, with a black cape on top held in place with a gold disk. Pete has a conical black goatee and pencil-style moustache, and he wears a black cavalier hat with a large white feather sticking out. During battle, Pete wears a different outfit; he now wears a red-purple shirt with black pants and a red sash, topped with a small golden crown on his head. He retains his gloves, boot and pegleg. Like Captain Pete, he also instead has a standard white set of teeth instead of his signature four square teeth. Captain of the Musketeers. He was after the crown and kidnapped Princess Minnie to get it, but Mickey and the Musketeers put a stop to his schemes. This page was last edited on 24 March 2019, at 20:05.